The Journal of Asian Martial Arts did an in depth story on Fairbairn a few years ago. I also spoke of him in one of the history lessons. This should give you more depth. 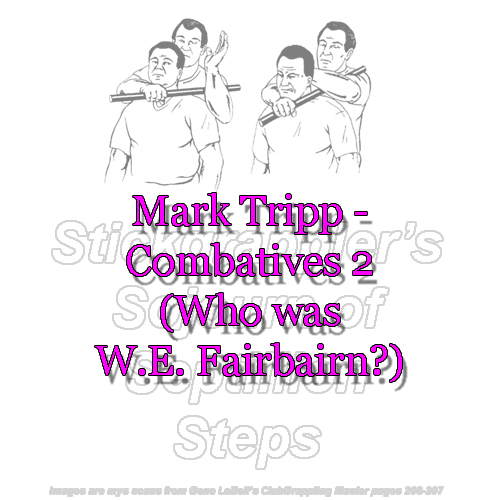 Simply put Fairbairn was someone who was deeply fascinated by close quarter combat, and the realities of same. He spent his time learning and mastering anything that had to do with this subject. He went to the Kodokan and received a Second Degree Black Belt from Kano him self. But it wasnt just unarmed combat that Fairbairn studied. Guns, Knives, Clubs, improvised weapons; and ways to use them came under his study. He created a bullet shield and would hold it while being shot to test (and in this case refute) common beliefs about the power of handgun rounds. He also did tests by shooting live animals as well as cadavers. Needless to say; these experiments did not sit well with the image of the proper English gentlemen. It was decided that it would be best if they sent Fairbairn away somewhere; FAR away somewhere. Fairbairn was assigned to head the Shanghai Municipal Police in 1927. The city was in total anarchy. Marauding gangs of renegades terrorized the city. A seaport city, Shanghai had more than its share of back-alley street toughs. Europeans and Asians battled each other and among themselves in almost daily brawls that took the form of small riots. In order to quell the dangerous mobs, Fairbairn trained his people in the methods he created. He and his small squad of men restored law and order to Shanghai, but not until they had proven his CQC methods in countless street wars. Fairbairn was involved in over 200 certified encounters, almost all against armed thugs. Peace was restored to Shanghai, but elsewhere in the world, worse conflict was erupting. The British had just been dealt the horrible blow known as Dunkirk. They were sure a German invasion of their country was on the way; and they knew all too well they were not prepared for such an event. Fortunately; they knew someone who was. They sent for Fairbairn. On the trip back to England; Fairbairn wrote the book Get Tough (which you can still get to this day); and penned the outline of training for the newly created Home Guard. This training course would set the standard for what would be called Commando fighting. Even still; there were proper gentlemen who refused to accept Fairbairns concepts of, as they called them, gutter fighting. (There is a great letter from one such officer that cracks me up to this day as he speaks of the traditions of proper fighting and all that). In 1940, the British government called upon Fairbairn to teach his method of CQC to the Allied soldiers. His system was termed commando techniques. The British, Canadian, and American elite forces all came under the influence of Fairbairn. This special training program was in Canada; and there is a film (directed by the great John Ford) of this training. You can sometimes catch part of this film on the History Channel. One of the students here was an American, Lt. Col. Rex Applegate. He would further modify and add to this system. The resulting system was taught to the operatives of the Office of Strategic Services (OSS). The men and women of the OSS learned their skills to be used behind enemy lines. The Fairbairn-Applegate techniques of the quick-kill were taught to these agents who would infiltrate, spy upon and sabotage the Nazi forces. The OSS was later to become the Central Intelligence Agency (CIA). The techniques developed by Fairbairn were meant for survival; there was no sport aspect. Indeed, the methods are brutal and ruthless. He devised techniques that would allow the physically weaker and smaller agents, including women, to defeat larger, stronger enemies. This meant that the concept of self-defense had to give way to the idea of self-offense. Fair Play was OUT; and the agents had a variety of hidden weapons to assist them in killing a man quickly and silently. Knowing the environment and scenarios in which the agents would likely find themselves, Fairbairn devised techniques that would succeed in confined areas, such as railroad car compartments, automobiles, and theater boxes. The techniques had to be devastatingly effective. At the very least, failure meant capture, torture and execution. But, even more significantly, failure also meant the fate of the free nations of the world would be jeopardized. Fairbairn, whose own country was under the nightly blitzkrieg attack, knew all too well the price of failure. His methods had to work. It was that simple. And they had to be mastered in weeks, not years. Time was also the enemy of the Allied forces. His methods had an aggressive, brutal effectiveness that reflect the dire necessity that birthed them. Thanks for another great post. Do you have an opinion on Bradley Steiner and his American Combato? From what I understand, he studied under Fairbairn and Applegate. I highly doubt he trained under Fairbairn (too young); and I am not sure Applegate either. In his books he claims linage to them; and there is good advice in there. Thanks. I might be mistaken about Fairbairn, but I knew he said he trained with one of them. I live in the Seattle area, so I might try to look him up. I believe he trained with one of Fairbairns original students from England. I have also heard that fairbairns stuff had some very good Judo moves, dont know this for sure. Yep; traditional Kodokan Judo was a very important influence on both men. Are you going to describe some of these techniques and training methods? - If so, I can't wait! Of course...that is the point of it being in the judo folder! NOTE: Posted as-of Apr 28, 2000 on Nov 22, 2013 to mirror my old archives - http://stickgrappler.tripod.com/ug/mtcombat2.html. Scrapper - Card Workout Explained!